Rather than just re-use themes from the television series (as was later done with G.I.Joe: The Movie), Sunbow contacted Scotti Brothers Records about adding a heavy metal edge to the soundtrack. Rocky IV composer Vince DiCola was also hired to write the synthesized techno-rock score, which would tie in well with the heavy metal songs. 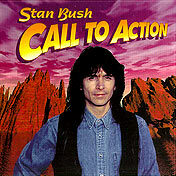 Stan Bush's upbeat rock music gives the movie it's inspirational motive, N.R.G. 's "Instruments of Destruction" sets the tone for the movie's villains, Lion's rendition of the theme song redefines the sound of the series, and Canadian metal band Kick Axe (aka "Spectre General" on the Scotti Brothers U.S. label) contributes to the soundtrack with two driving metal songs. Perhaps one of the first influential electronic musicians in the field of film scoring, Vince DiCola received his first success in Hollywood co-writing eight songs for the hit film Staying Alive, including the Frank Stallone song "Far From Over", which features Vince on keyboards. His work on that film led to even greater success when he wrote the memorable score to Rocky IV, and later TF:TM. He is a regular attendee at Transformers conventions and has continued to compose new Transformer-themed works. The Rhino DVD of TF:TM features an insightful interview with DiCola. The song "The Touch", written by Stan Bush and Lenny Macaluso, was used in the 1997 film Boogie Nights, performed (in an intentionally horrible manner) by "Marky" Mark Wahlberg's character. This version of the song is on the soundtrack as one of the "hidden tracks". The motion picture soundtrack was distributed by Scotti Bros. Records. It was originally released on vinyl record and cassette, and has been released in the U.S. on CD by Scotti Brothers Records and later was re-released by a company called Volcano. While the original soundtrack is very cool, and makes great driving music, it is unfortunate that so much of Vince DiCola's instrumental score has been omitted from it. 2. Instruments of Destruction - performed by N.R.G. The soundtrack was released in Japan around the same time as the film was released there on Laserdisc. (Probably some time around 1989.) Since I do not have a copy of this version I cannot confirm it. Please contact the webmaster if you have additional information about this release. 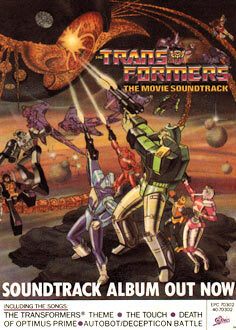 The rest of the musical score (including the ominous "Unicron's Theme") by Vince DiCola was originally released in 1997 as a two-CD set. Entitled "Til All Are One," these CD's contain all of the music that is in the movie that is NOT on the soundtrack, with an additonal disc entitled "Call To Action" which contains additional previously released and non-released Stan Bush anthems and "action themes". 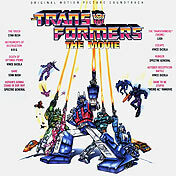 The musical score disc also contains a different version of the Transformers theme song performed by Stan Bush, as well as an unused piece entitled "Legacy" that DiCola composed as a demonstration to the producers. 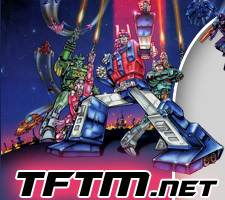 The full-color cover artwork was drawn by legendary TF comic artist Andrew Wildman, with help from Glen Hallit. This set was released for the Botcon 1997 convention for limited release only and has been discontinued. Good luck finding this set on Ebay. 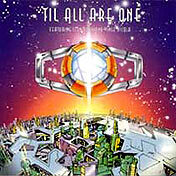 The second disc of the "Til All Are One" set, entitled "Call To Action", has been released independently by L.A. Records with a different cover. It contains additional themes from films and TV, including re-recorded versions of "Dare" and "The Touch", as well as "Never Surrender" from the movie "Kickboxer", "Capture The Dream" from the 1996 Olympic Games, plus some new titles, all containing "action" themes. 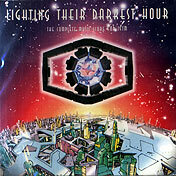 The entire musical score by Vince DiCola (including the tracks previously omitted from the "Til All Are One" set that were on the original soundtrack) was re-released in its entirety on a CD entitled "Lighting Their Darkest Hour". This disc, released in limited numbers at Botcon 2001, has been discontinued but can more easily be found than the original 2-disc set. It features a modified version of the original artwork by Wildman and Hallit, with a Beast Wars-style Matrix/Spark Chamber courtesy of Mainframe Entertainment. The order of the tracks (and some of the track names themselves) have been altered slightly to match the order of the scenes from the final film. Missing from this set is the "Legacy" track and all the songs (with vocals) not by DiCola on the soundtrack. It does, however, include the piece "Attack on the Shuttle" which was later replaced by N.R.G. 's "Instruments of Destruction" in the film. 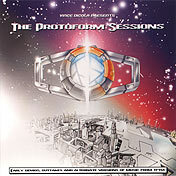 "The Protoform Sessions" is a CD that was released at Botcon 2001 by 3H Enterprises and Vince DiCola. 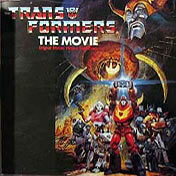 It includes early demos, outtakes, and alternate or extended versions of tracks from the score to TF:TM, each preceeded by a brief commentary by DiCola. It provides plenty of insight into the creation and evolution of an animated feature score. It also contains some tracks recorded as rehearsals for the Botcon 1997 concert with Stan Bush (minus the Stan Bush vocals). 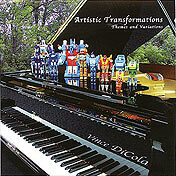 For Botcon 2001, 3H Enterprises and Vince DiCola released this CD which contains themes and variations of various music from the TF:TM music score, performed with just a solo piano. It is a testament to Vince DiCola and his amazing talent as well as the beauty of his compositions. You really have to hear the piano-only version of "Unicron's Theme" to understand why he is truly a genius. Ernie Petrangelo, guitarist, producer and writer from the band NRG (and formerly known as Ernie Burns) released this CD in 2001 for the 15th anniversary of TF:TM. It contains the original unedited version of Instruments of Destruction, as well as a 2001 remix of the song, along with many other NRG tracks. You can often find autographed copies of this CD on Ebay.